CONFEDERATE 25 STAR ARKANSAS FLAG. OLD PHOTO PRESIDENT ABRAHAM LINCOLN 14”X 11”. WRITING ON BACK PRESENTED TO? BY THE PRESIDENT 2 MONTHS BEFORE HE WAS KILLED. STERLING SILVER PORTABLE INK WELL. 1898 PRESENTATION GERMAN MILITARY PEWTER CUP. CIVIL WAR AMBULACE WATER KEG. CIVIL WAR USA SADDLE SHIELD. J.B. SCHOTT SADDLERY QUINCY ILL. HORSE BRUSH. SMOOTH SIDE CIVIL WAR CANTEEN. 40-CALIBER BRASS RIFLE PICKET BULLET MOLD. DUG CSA BUCKLE GETTYSBURG PA.
AB. LINCOLN LITHOGRAPH CURRIER & IVES. DES. MOINES IOWA G.A.R MEDAL. CIVIL WAR MEDICAL HORSE BIT. 1800’S MILITARY BELT & BUCKLE. RARE CIVIL WAR FIELD MICROSCOPE. CIVIL WAR IVORY NOTE PAD. PARIS TEXAS CIVIL WAR BUCKLE. CDV PHOTO GEN. JOHN HUNT MORGAN. CIVIL WAR U.S BUCKLE & BELT. CIVIL WAR U.S CARTRIDGE BOX. BOYLE & GAMBLE BOWIE KNIFE. 1800’S SPURS & LEATHER STRAPS. USS NAVY BALTIMORE GEORGE DEWEY MEDAL. DR. P.B. BREINIG CIVIL WAR SURGEONS CASE. CONFEDERATE Harper’s ferry MODEL 1803 54-CALIBER RIFLE JOHN LEWIS BOYD 22ND VIRGINA CAVALRY. Presentation Spurs TO ATTORNEY DATED 1840 FROM Miners. U.S. GRANT PERSONAL BEARD COMB. TEXAS CONFEDERATE COUNTY NOTES & SCRIPTS. 14k SOLID GOLD WOMANS RELIEF CORPS. GENERAL McDOWELL CDV PHOTO BULL RUN. CONFEDERATE SOLIDER 1/4 PLATE AMBROTYPE PHOTO. C. GOVE DENVER CITY PLAINS RIFLE. CIVIL WAR SILVER BAR ABE.LINCOLN. EDWIN S. BELKNAP CIVIL WAR SILVER DOLLAR 1860. CONFEDERATE STATES OF AMERICA 1862 MEDAL. ABRAHAM LINCOLN FUNERAL TRAIN CDV PHOTO. Abraham Lincoln’s funeral train left Washington on April 21, 1865. It would essentially retrace the 1,654 mile route Mr. Lincoln had traveled as president-elect in 1861 (with the deletion of Pittsburgh and Cincinnati and the addition of Chicago). An example of a published schedule is pictured to the right. The Lincoln Special, whose engine had Mr. Lincoln’s photograph over the cowcatcher, carried approximately 300 mourners. Willie Lincoln’s coffin was also on board. Willie, who had died in the White House in 1862 at age 11, had been disinterred and was to be buried with his father in Springfield. A Guard of Honor accompanied Mr. Lincoln’s remains on the Lincoln Special. Mr. Robert Lincoln rode on the train to Baltimore but then returned to Washington. $595. 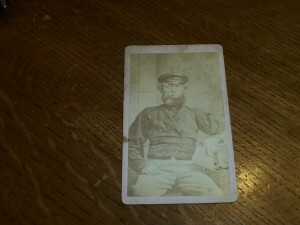 Rare civil war Seaman PHOTO. SMALL GUN POWDER FLASK EAGLE STANDING PISTOL. CIVIL WAR PERIOD CIGARS IN BOX. ARKANSAS IDENTIFIED 6TH RGT ARK VOL CO.A BUCKLE. U.C.V ROBERT E.LEE POCKET WATCH. RARE CIVIL WAR HOT SKILLET HOLDER. ETCHED BLADE AMERICANS MUST AND SHALL RULE AMERICA. CORSAN DENTON MAKER. 1850’S ERA. POST CIVIL WAR CONFEDERATE GENERAL SADDLE. CONFEDERATE DAGGER & SHEATH NEW ORLEANS. G.A.R CIVIL WAR PAPER WEIGHT. CIVIL WAR US CARTRIDGE BOX PLATE. US CIVIL WAR BELT BUCKLE. 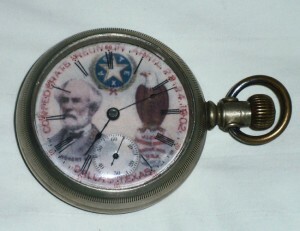 CIVIL WAR G.A.R POCKET WATCH. SWANN SHANK SILVERED CIVIL WAR OFFICER SPURS. POST CIVIL WAR FEDERAL BUCKLE. CIVIL WAR TWO PIECE U.S BUCKLE. CIVIL WAR C.S.A FOB & BUCKLE. RARE DAUGEROTYPE PHOTO ABE.LINCLON IN COFFIN. ULYSSES S.GRANT FOR PRESIDENT BROADSIDE. RARE CONFEDERATE SHIRMP HANDLE KNIFE. SUPER RARE COLT REVOLVING RIFLE GANG MOULD.